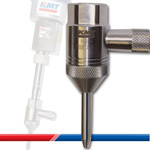 For stainless steel, metal, copper, titanium and similar hard materials that cannot be machined with water only, KMT Waterjet abrasive cutting nozzles provide the most advanced alignment technology for precision cutting with minimal kerf while holding tolerances up to +/-.003"/.076 mm. 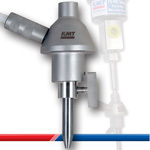 Choose from diamond orifices or sapphire orifices to cut with the KMT Autoline or KMT IDE abrasive cutting head series. Also available are water-only cutting valves: Normally Open and Normally Closed (NO/NC Valves). The high velocity waterjet creates a vacuum which pulls the abrasive into a mixing chamber, producing a coherent, extremely energetic abrasive jet stream. This process is ideal for cutting steel up to 12"/30 cm, cutting intricate patterns in sheet metals, titanium, composites, decorative stone, synthetic ceramics, glass, and much more! In a controlled blind test conducted by the University of Missouri-Science & Technology, the KMT Autoline® waterjet nozzle ranked first overall, outperforming nine other waterjet manufacturers. The self-aligning components of the Autoline® nozzle provide true, perfect alignment to extend the life of focusing tubes and mixing chambers. Everyone claims alignment, however, only the precision finish of the orifices in the Autoline® enable true precision alignment. Focusing tubes last longer & wear evenly in an aligned cutting head. Finally! A cutting head with the fewest possible parts making performance simple and reliable. Now, the only pieces which need to be replaced are the focusing tubes and head body. Each IDE® Water Jet Nozzle has a permanently mounted diamond and mixing chamber and each includes the removable abrasive inlet, focusing tube retaining nut, retaining ring and high pressure filter element.